(1) Align the scribe line on the sight with the scribe line on the bracket. (2) Place the sight in the grove of the bracket and tighten the lever screw clockwise. (3) Secure the lever screw with lacing wire or tape to ensure the sight does not vibrate loose. (1) Remove the lacing wire or tape from the lever screw. (2) Loosen the lever screw until the sight is free to be lifted off the bracket. (3) Remove the batteries and place the sight in its carrying case. e. Boresighting. 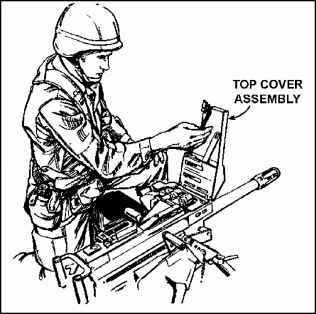 The AN/TVS-5 cannot be boresighted when used with the MK 19. The sight cannot focus on a target closer than 25 meters, and the offset is too great at that distance to boresight accurately. f. Zeroing. To zero the AN/TVS-5 to the MK 19, follow the procedures in TM 115855-214-10.